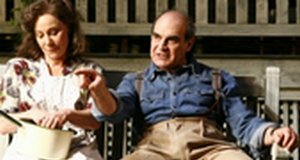 Howard Davies produced Arthur Miller's second play All My Sons at the Cottesloe in the year 2000. ( the review). Almost ten years to the month, the same director brings his production to the commercial theatre, the Apollo in London's Shaftesbury Avenue with William Dudley's, then and now, magnificent design of a substantial wooden American house complete with porch and a luxuriant green garden, straight out of paradise. All the action takes place in the garden of the Kellers' home with neighbours dropping in. Completely re-cast, the production is all the stronger for the magnificently darkly brooding David Suchet as the complex and corrupt Joe Keller. Zoê Wannamaker plays Kate Keller, mother of a missing pilot who, three years after his disappearance, clings to the hope that he may be alive. Bringing the situation to a head is the arrival of Ann Deever (Jemima Rooper), Larry the missing son's, fiancée. The Deevers used to live next door to the Kellers. Ann is now being secretly courted by her dead fiancé's brother, Chris (Stephen Campbell Moore) and her father is in prison for his part, having taken the blame for releasing defective aircraft parts at the factory where he worked for Joe Keller. As Miller's plays almost always are, All My Sons is a re-working of the disintegration of the American Dream, the opportunity to make it financially in the New World falling apart. The theme of All My Sons, the temptation to cover up a potential loss making exercise under financial pressure, is as patently present and relevant in 2010 as it was to the 1940s. I found all the performances completely credible. Stephen Campbell Moore's thoughtful, dutiful Chris tied to the memory of his brother and frustrated by his mother's refusal to accept that everybody needs to move on. His choice, either to move away or to confront his parents, is clear. David Suchet, with his dark countenance, is very much the controlling pater familias with his dreadful secret, and yet he is not dislikeable. He is an affable, decent man who faced with a choice has made the wrong decision which has unknown and terrible consequences. His sin is compounded by the unnecessary deaths and the damage to the Deever family caused by the cover up, but these are just corporate consequences. The Furies will also strike home at the heart of his family. You can clearly see the parallels with Ibsen. Zoë Wannamaker, steely and determinedly in denial, contrasting with her unruly hair which escapes from the pinned back style, opens the play with the symbolic device Howard Davies used ten years ago. During the thunderstorm, Kate wakes and comes into the garden and sees the trunk of the apple tree, which was planted for Larry, crack in two. If anyone believed in omens this would be it. As Kate recalls her dream we hear the roaring noise of aircraft engines behind the wind and storm. Her low groans when she reads the letter strike to the depths of a bottomless emotional chasm, a mother's love for her son. The performance I found most divergent from that in 2000 is Jemima Rooper's Ann. She is peaches and cream, an all American, nervously smiling girl. This works but, unlike the performance given by Catherine McCormack, she seemed to me to be the sort of girl who would long ago have blurted out the contents of the letter from Larry or shared it with one of her girlfriends. Her hair and clothes are perfectly in period with her long film star waves curled under on her shoulders. The conviction that she has of her father's guilt and of Mr Keller's innocence can only reflect stupidity, or a misplaced loyalty to the Kellers rather than her own family. This is a superb revival that after a decade testifies by retaining freshness and stimulating ideas.